Throughout history horses have been respected, admired, revered and put to work like no other animal throughout the human experience. Dogs and cats have been our beloved companions and have at times been used for utilitarian purposes, however it was the horse that got the big jobs done. Americans relied intensively on the horse to facilitate our westward expansion, to till, harvest and deliver our food, and to move raw and finished materials that were so necessary to our early economic growth. Mechanization has markedly reduced the horse’s role as a work animal, however horses are still used to perform a remarkable number of jobs. Horses still remain the companion species that can literally take us where we want to go and that can serve as our teammates in sporting and competitive events. In spite of their history and their immeasurable importance in our development as a nation, horses in our country exist in a very bizarre legal gray area of confusing and conflicting laws and regulations that often lack any true definition. While America’s very first animal cruelty laws addressed the treatment of horses, our nation presently has no coherent modern policy with respect to these incredible animals. Domestic horses walk a line between pets and livestock. They exist within a murky lack of designation that has produced gaps with respect to legislation intended to protect the welfare of our workmates and companions. The absence of any national consensus as to whether they presently exist as work animals, companion animals (pets) or simply livestock has produced a hodgepodge of inconsistent laws of which unscrupulous individuals take advantage in order to unreasonably exploit horses for profit. It also creates a treacherous opportunity for a whole class of animals that were not raised as food animals to enter the human food supply by being exported for slaughter. Slaughter is clearly treacherous for horses, however it is treacherous for humans as well. Everything that goes into animals raised for food, including drugs and medications, is regulated and producers are required to keep records. Horse owners medicate horses for a variety of reasons and when those horses find their way into the human food supply, they present a rogue food source for which consumers have no ability to know what the meat they are eating might actually contain. Our export of potentially tainted meat is actually no less sordid than other countries shipping us children’s toys covered with lead based paint. These are things that modern, civilized countries simply don’t do. Any debate involving animals brings with it an emotional component. The horse debate is no exception and the exemplary role the horse has played in the United States is actually used against him. Is the horse a pet? Is he a working animal? Is he simply livestock? Can his status be changed at will to benefit someone wishing to make a quick buck? Efforts to bring some continuity to this issue often get bogged down in committees and debate. These debates often become filled with circular logic, misrepresentation of facts by special interests, and a lack of clear statistical data. In the meanwhile we continue to export an agricultural product that is unregulated, inhumane, and unsafe. “My little pony” is still being crammed into a double-decker cattle truck to be stabbed to death in Mexico. This clear lack of definition and the consequences of our failing to come to grips with how we care for the most significant animal in our history become magnified when we begin to look at the wild horses of America. When we think of “wild horse,” most people think of the Bureau of Land Management (BLM.) BLM was tasked by Congress to manage most of the wild free-roaming horses in the United States, however many wild horses fall into other jurisdictions run by other Federal and even state agencies. It stands to reason that if we can’t pass any consistent legislation addressing our domestic horses, achieving any national policy to collectively protect America’s wild herds is little short of a nightmare. In 1971 something truly remarkable happened. In response to public pressure, both houses of Congress unanimously passed a bill. Congress’ intent clearly was to protect and preserve America’s free-roaming horse herds and proscribe methods by which the Secretaries of Interior and Agriculture were to manage those herds. Congress finds and declares that wild free-roaming horses and burros are living symbols of the historic and pioneer spirit of the West; that they contribute to the diversity of life forms within the Nation and enrich the lives of the American people; and that these horses and burros are fast disappearing from the American scene. It is the policy of Congress that wild free-roaming horses and burros shall be protected from capture, branding, harassment, or death; and to accomplish this they are to be considered in the area where presently found, as an integral part of the natural system of the public lands. Congress recognized that horse herds would grow and would require management, and that part of that management involved removing some excess horses from public ranges. It was envisioned that horses that were removed would be provided to American citizens by means of an adoption system so that those horses could be cared for, and in most instances, become gentle and useful as riding and companion animals. The adoption program was intended to ensure that these horses continued to receive proper care over their lifetimes and stimulate the agricultural economies where they were placed. At the time it was estimated that over the lifetime of each horse, the average adopter would voluntarily direct around $20,000.00 of his or her disposable income to pay for hay, supplies, farrier and veterinary services and other expenses related to the training and maintenance of an adopted horses – as opposed to sending that same money overseas for foreign made consumer products. 2004 figures showed the adoption program, when properly run, to provide a four billion dollar stimulus nationwide, calculated over the lifetimes of the horses placed. But somewhere in the implementation of the Act, something went terribly wrong. In its findings, Congress declared, “these horses and burros are fast disappearing from the American scene.” However the agency tasked by Congress to protect and preserve these horses became a machine that removed more horses from public lands than any other entity in modern history. As BLM’s management approaches became more reflective of special interests than of science, horses disappeared from our public lands and piled up in a complex system of holding facilities. This trend finally reached a point that more “wild free-roaming” horses were held in corrals than were freely roaming western public lands. And, as with so many laws, disreputable people found loopholes. Protected horses continued to find their way to slaughter, oftentimes through slight-of-hand paperwork. There are valid reasons that the American legislative process is to be conducted out in the open with opportunity for debate. Decisions made by consensus are oftentimes better reasoned and more appropriate than decisions made by a single individual. Senator Burns’ stealth action ultimately harmed the horses, harmed BLM, harmed the American taxpayer and even harmed Burns’ special interests. The sudden unexpected appearance of Sale Authority was akin to a passenger pulling the emergency brake cord on a commuter train. BLM had to scramble to implement a new ill-conceived program, taking resources away from an already strained adoption program. Horses were sold and went to slaughter. As a result most horse organizations and private citizens capable of taking in Sale Authority horses and placing them with private individuals stayed away, fearing the potential fallout if any of the horses that they received ended up at one of the slaughterhouses. Meanwhile BLM’s regular adoption program fell further behind as BLM’s limited staff and finances had to be directed to a program that basically didn’t work. Senator Burns also discovered that there were repercussions for his actions. When he came up for reelection, a Democrat defeated Burns. When the public viewed Senator Burns’ stealth rider as a product of influence the beef cattle lobby, many consumers modified their food choices, adversely affecting beef prices. Senator Burns illustrated how bad public policy can have far-reaching implications. Meanwhile America’s wild free-roaming horses continued to suffer their fate of “fast disappearing from the American scene,” and the problems associated with BLM’s Wild Horse and Burro Program were far from being solved. While the spotlight shined on BLM, horses and burros on a number of other Federal lands were suffering under even more chaotic management. When the Act was passed, the general understanding was that nearly all the free-roaming horses and burros on Federal lands were found on lands administered by the Bureau of Land Management and the U.S. Forest Service. As the numbers of horses on these public ranges diminished, it became evident that other Federal agencies also managed free-roaming horse and burro populations, and that management was less coherent, less efficient and more hazardous to the animals than the much criticized actions by BLM. The National Parks Service proposed to shoot burros that were, ironically, much sought after by adopters in the Eastern States. The U.S. Fish and Wildlife Service conducted chaotic roundups and sold horses by the truckloads to slaughter buyers. Clearly Congress’ intent to provide for a coherent, humane and practical management strategy for free-roaming horses and burros on Federal lands was not happening. After years of trying to let the BLM correct its problems in-house, legislators in Congress, led by Congressman Nick Rahall, said “enough is enough” and drafted a bill designed to overhaul the management of wild horses and burros on public lands. The bill passed by a majority of 54 votes in the House of Representatives, and as of this writing the bill has been referred to the Senate. The House version of the bill was named HR.1018, the Restore Our American Mustangs (ROAM) Act. As was expected, hysterical opposition to the bill has emerged, fueled by special interests, and exaggerated claims abounded predicting everything from the bill bringing about the ruination of the Federal budget to a tsunami of horses flooding back into Nevada and sweeping everything else out in its wake. When one actually reads the bill, it primarily forces BLM to get its act together and seriously explore alternatives other than simply rounding up horses and feeding them in holding facilities in its efforts to manage horse populations. In its present form, the ROAM Act restores prohibitions on the conversion of these protected animals for commercial products (slaughter) and it requires a number of potentially positive changes in the way free-roaming horses and burros are managed on Federal public lands. * Outlines specific program reporting requirements so that Congress and the American public can be informed as to BLM’s progress with respect to complying with the provisions of this law. Many wild horse advocates who supported the bill as passed in the House hope that the Senate version will close a few additional loopholes that they view as being problematic. * “Transportation” for purposes of converting protected horses and burros into commercial products needs to be added to the list of prohibitions. The shipper is the last person who has custody of animals crossing our borders and under current law a shipper could argue that he didn’t actually sell the horses for slaughter. * Federal law should permit disposal of deceased or euthanized horses by means of rendering since many local laws prohibit burying horses on private property and many landfills will not accept horses that were euthanized by use of barbiturates. * Congress is asking for a coherent and consistent management strategy for horses and burros on all public lands. Therefore that language that appears in the original Act that limits its application to BLM and Forest Service lands should be stricken and the Act should apply to all horses in the various jurisdictions under the Secretaries of Interior and Agriculture. * Specific examples of “fatally injured or terminally ill” should be stricken from the section that describes conditions under which horses may be humanely destroyed. The list that appears in the bill includes conditions that aren’t fatal or terminal, and such determinations should be left to a qualified veterinarian on a case-by-case basis. As I began to look at the issues surrounding wild horses I came across some very interesting people involved with the care of these magnificent beings. As I looked closer I began to see the overwhelming obstacles they faced. Wild horses can be found on federal property, state property and private property. The regulations that govern their management and protection vary according to where the horses are located. Even different Federal agencies have different rules. Horses standing on the south side of the Carson River in Nevada are covered under one set of protections, yet if these same horses happen to be found on the north side of the river, those protections don’t exist and a different set of rules apply. Much of the BLM’s public lands on which horse populations range are leased to special interests and permittees under the “multiple use” doctrine. However some of these interests that are permitted to graze, mine and “harvest” on our public lands start behaving as if these public lands were their own private property. Subtle changes in administrative laws and procedures have created a situation where it can oftentimes take years for agencies to reign in rogue permittees, some who not only violate the terms of their permits, but in some instances have stack up tens of thousands of dollars in unpaid permit fees before they are eventually held accountable. In the meanwhile the horses and the taxpayers suffer. Rural Nevada can be a dangerous place for BLM and Forest Service personnel who find themselves at odds with a few of the old time ranching families. In some instances rural Nevada law enforcement offers little, if any protection. Federal employees are not permitted to venture alone on some rural Nevada public lands, and the Las Vegas Review-Journal reported the situation to be so threatening that some Federal workers quit their jobs rather than face the risks. If someone routinely threatened Federal employees in any of our urban areas, the perpetrators would likely be arrested under the Patriot Act. However such conduct seems to be acceptable in rural Nevada. Leases and grazing permits are occasionally issued without having accurate data on elements as basic as horse population counts. When the number of cattle allowed under a new ten-year grazing permit is based on a gross undercount of the horses present, then overgrazing is surely likely to occur. When the range resources subsequently start to become depleted, the knee-jerk reaction is often, “Remove the horses!” In many instances these problems are not caused by BLM field staff, but rather by a system that doesn’t provide real statistical data and requires field personnel to rely on estimates and computer model projections. Managing horse-human conflicts in more urban areas isn’t much easier. The encroachment of suburban development in and around horse ranges presents a whole new set of problems. Although state law in Nevada requires developers to fence horses and livestock out of new developments that abut pasture and grazing ranges, enforcement of this law is sporadic at best. Oftentimes horses are removed at taxpayer expense when they wander into unfenced developments to graze on lawns and the California-style grass medians and shoulders found on residential boulevards. I began to follow some of the issues in Nevada and took a trip to see things with my own eyes. I saw the main BLM facility in Palomino Valley. They were in the process of clearing the facility to clean it and prepare for the next round of gathers that will start in August. The BLM claims to be broke. It claims to have no money to support the 33,000+ horses it currently has in holding. The BLM suggested that it might have to develop plans to kill these horses because of the costs. However BLM is preparing to do another round of gathers. BLM claims that it must continue gathering horses at the present rate due to over-population. However oftentimes BLM doesn’t really know how many horses are out on the range because the agency relies on computer modeling and guesswork more often than “hard” actual animal counts. BLM has closed millions of acres to horses – acres that were provided to the horses by Congress – citing the difficulties in managing those particular ranges for horses. So the horses were rounded up and tens of thousands stand in contract holding facilities where they receive feed and care at significant taxpayer expense. This is money that could have been much better spent improving range conditions and developing proactive management strategies, however BLM’s obsession with removing horses has produced the greatest animal boondoggle of our generation. The BLM claims that it does not gather during “foaling season.” Such a claim is ostensibly true since most horses foal in the spring. However the sheer volume of horses being snatched up by BLM’s “gathering machine” requires gathers to begin as early as August. While most mares have already foaled by then, there are still thousands of young foals out on the range. When I visited BLM’s Palomino Valley Center on July 21st, the only horses remaining in the facility were mares with foals. These were mares that had been brought in while pregnant and had foaled while in the facility, and a few were possibly from an emergency gather because of a wildfire. Many of the foals were still quite young and nursing, and they were representative of the age and fragility of countless foals still out on the range. It doesn’t take a three-year governmental study to recognize that August gathers can be extremely risky for young foals and that gathering horses in the August heat in Nevada’s high desert ranges is stressful and dangerous to horses and humans alike. I have tried to find any impartial study that resembles a credible analysis of the environmental impacts of removing large numbers while increasing the populations of European cattle. If one exists, I can’t find it. If BLM’s intention is to comply with the law and maintain healthy herds of free-roaming horses on our public lands, then the removal of large numbers of any animal from the wild should be monitored closely, and the long-term implications of successive gathers as well as alternatives to outright removals should be investigated and analyzed. Nevada is the most arid state in the Union and experiences extreme environmental changes from one region to the next. However for the most part Nevada’s horse and burro herds can adapt to changing conditions. In fact it is this oft times harsh environment that makes America’s “mustangs” what they are. These herds are the product of successive generations of survivors. Occasionally some ranges suffer a catastrophic failure of rainfall and forage. Since the horses cannot migrate to new ranges due to man-made barriers, BLM does have to intervene. 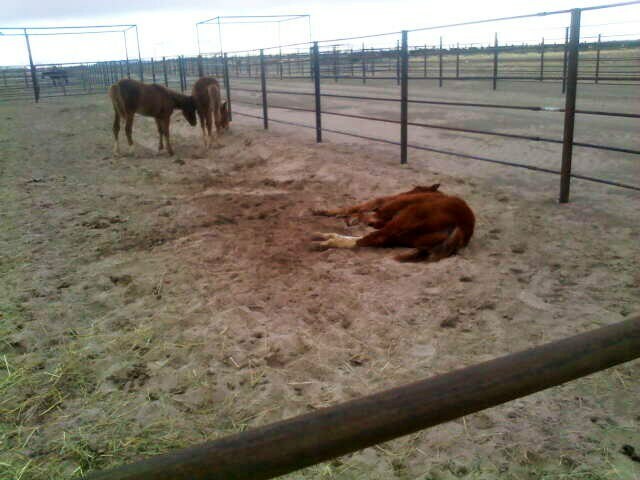 Usually by the time they are brought in, the horses have fallen into pretty poor condition. Ranchers and other interests who want to see horses removed from the range take these rare, but recurrent situations and attempt to portray the entire range inhabited with suffering, starving horses. A more accurate portrayal is that BLM, the agency charged with managing horses on our public ranges, was asleep at the switch and allowed a problem to turn into a full blown emergency before it took corrective action. Furthermore, BLM’s response is usually not to address range conditions and prevent such emergencies, but keep the round-up machine running at full speed. I also saw some situations at BLM’s Palomino Valley Center that raised concerns. Wild horses are high desert animals, however when out on the range the horses will often find shade or breezy locations during the heat of the day. BLM’s Palomino Valley facility provided virtually no shade for the horses held there, and neither do the contract holding corrals in Carson City and Fallon. A private adopter is not allowed to keep a BLM horse without providing sufficient shade, even if the horse is on grass pasture, yet BLM keeps thousands of horses in hot, sandy lots without shade. BLM claims the horses are only held in these corrals “short term,” however in reality “short term” can literally mean years. BLM feeds various kinds of hay to the horses that are brought in, depending on the condition and needs of each group of horses. However most of the horses are eventually switched over to straight alfalfa. Many modern nutritional studies have concluded that straight alfalfa is not desirable for horses, particularly those that are not receiving much exercise. However the feeding of alfalfa is based on economics, not horse health. In Nevada, alfalfa is typically sold at a lower price than grass hay. As a practical matter, most of BLM’s field personnel who actually work with the horses seem to care about them. However somewhere up in the bureau’s hierarchy, policy decisions are being made by people who have apparently forgotten that BLM’s mission with respect to America’s wild free-roaming horses and burros is to manage, protect and preserve our heritage herds. Wild Horse Advocacy – The Front Lines? On July 22 I was in Carson City and visited a demonstration that took place in front of the State Capitol. The demonstrators were members of several of Nevada’s wild horse groups and they were protesting the mistreatment of the Virginia Range horses at the hands of the Nevada Department of Agriculture. The Virginia Range horses roam the Comstock National Historic District and the hills around the old gold rush town of Virginia City. The BLM pulled out of the region decades ago, so the horses fell under the management of the counties, then under the jurisdiction of the Nevada Department of Agriculture. The wild horse advocates had been tracking what they claimed were a series of unlawful activities on the part of certain Agriculture officials, including illegally selling horses “out the back door,” dumping horses out of state, and attempting to extort favors from horse groups by threatening to kill orphan foals if groups didn’t comply. The groups sought corrective action from the Governor’s Office. Trying to make any sense of of the local issue was an exercise in futility. The layers of accusations were like peeling an onion and appeared wrapped in not only disgust with local politicians but an historic feud rivaling the Earps and Clantons between advocates. I have to remind myself that all this is happening in Nevada, and in Nevada this kind of stuff is not so unusual. Skullduggery over wild horses often gets overshadowed by such things as stories about a former mob lawyer turned Las Vegas Mayor who wants to use Federal stimulus money to fund a mafia museum. And he apparently plans to run for Governor. Wild West? This is one small piece of the nightmare created by a lack of accountability through a national non-designation and standard for protocol of herd management. Current legislation needs to be written to create an umbrella that sets a standard for accountability and gives authority to manage resources that provide for the health of that environment. Clear data to support the decision making process must be gathered in a consistent fashion. Until such a designation and standard of accountability is created we will continue to see examples of political maneuvering to create profitable circumstances for a select few that hold contracts within each state. We will see laws written and abused to exploit a symbol of the American spirit. We will go about our days as these horses… our wild American icons… join our domestic horses in the pipeline, shipped over our borders, then brutally slaughtered and sent overseas to be eaten by foreign fine diners. (Action Items are no longer relevant. This article was written in 2009, at the beginning of the work of WHE and Leigh). Contact your representatives and ask that serious reform of policy and an investigation of contracts and management practices occur in within the BLM. Contact Secretary of Interior Ken Salazar exsec@ios.doi.gov or 202-208-7351 and ask that the BLM please refrain from taking premature action that may jeopardize this resource to the point of no return. Tell him that this issue must be dealt with now. Responsibility to the intent of the wishes of the American public expressed, as no other, in 1971 then gutted by Burns and allowed under past administrations to go unchallenged, MUST take place. This is a time in history when we as a people desperately need this symbol of the American Spirit.